As every child I liked sweet stuff when I was younger. In order to receive a cookie or candy, I always said “Mom! I am hungry!” My mom always replied with this: “No Justin, you are not hungry, you have an appetite for sweet things. Children in Africa are hungry, you are not hungry.” I always felt bad after she said this. At the time I couldn’t help the children in Africa and I still wanted candy. So often when I rephrased my question, and I still got my candy. Now, as every adult, I still like sweet stuff but now there is no mom in my house who guards the treasure of candy. So I was wondering how easy do I get to the treasure of candy? How much hunger do I need to experience before I grab something to eat? A previous experiment from me showed that I am hungry at only 55% of the occasions I eat. Thus, I eat often (45% of the time) without experiencing hunger. However, there is no such exact distinction between hunger and no hunger. It is more a scale that goes from “not hungry at all” until “very hungry”. Therefore, I want to know at what point do I start eating? My mom is not there to guard the treasure of candy anymore but you could also assume that I am wise adult now who balances his eating behavior. Secondly, I want to know how my hunger pattern works. I don’t know how my hunger changes over the day, and how my eating behavior is affected by it. I would assume that when I am hungry, I eat. Nonetheless, this should also work the other way around; when I eat this should reduce my hunger but I have no idea how quickly this effect occurs and for how many hours this effect prolongs before I get hungry again. Having knowledge about this could make me better time my meals over the days. Thus, the first am of this experiment is to examine how much hunger I endure before I eat something. The second aim is to understand my hunger pattern in relation to the calorie intake. To answer all these questions I have been tracking myself for 5 week days. At every hour I tracked how hungry I felt. I scored my feeling of hunger with a 0-10 score (0=no hunger at all, 5= little hungry 10= very very hungry). Next to that, I also tracked what I ate, how much calories it contained, and which moments I ate. I tracked the calories using Myfitnesspal, a food-diary app. Comparing my hunger with my calorie intake through the days would provide answers to all my questions. I am almost never hungry, on average I scored a 3.1 this week. On a scale from 1-10 this is quite low. The highest hunger score I rated was a seven. Four moments occurred when I scored a seven hungry-score. All these moments were in the same hour I ate my dinner. Still, a seven is not that high. So often I am nog hungry but when I eat I am quite hungry. 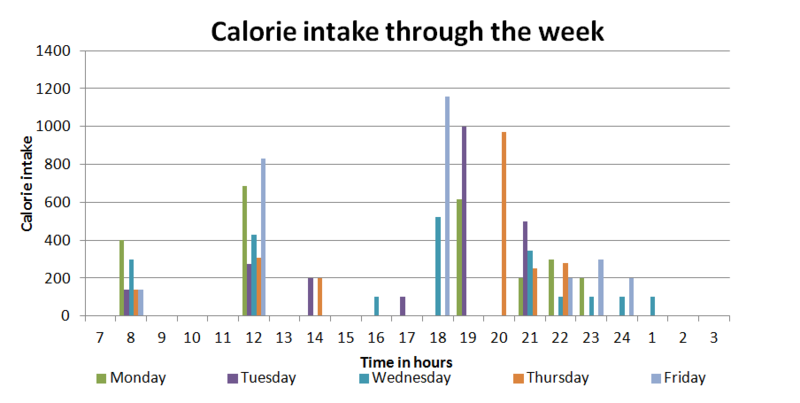 The next figure shows how my calorie intake patterns change over the 5 days. I have a quite regular eating pattern, I have breakfast at 8, lunch at 12, and dinner between 18 and 20 in the evening. I often finish the day with a snack or a drink that contain calories. Beer? Maybe, maybe beer sometimes. Figure 1. Calorie intake through the week. Almost every day I wake up a little bit hungry, I eat breakfast and my hunger reduces. At lunch time I have a sudden peak of hunger that decreases quickly after lunch. During the afternoon I am not really hungry but then I have a sudden peak at dinner. After dinner my hunger reduces within an hour and I am not hungry through the evening. This shows that at lunch and dinner I am often suddenly quite hungry. I surrounded these peaks with a red square to increase their visibility. There is a significant correlation with a moderate strength between my calorie-intake and my hunger (r=0.63, p<0.001). This means that when I am hungry I often eat or that when I eat I am often hungry. If you compare figure 1 with figure 2, you can clearly see the relation between both factors. The first aim of this study was to examine how much hunger I endure before I eat something. I found that on average I don’t experience that much hunger through the day but often I suddenly get hunger and I eat. Thus, I found that the second aim was closely related. This aim was to understand how my hunger patterns works. I found that my hunger patterns changes with quick peaks through the day. Regarding the fact that on average, I do not experience that much hunger through the day, is a result of eating a good breakfast, lunch, and dinner. Therefore, I am not very hungry through the rest of the day. Nonetheless, I am often quite hungry at breakfast, lunch, and dinner. My hunger pattern through the day could explain this. I found that my hunger pattern changes with big peaks through the day. I would have expected slowly changing patterns in my hunger through the days. If my body’s resources were getting empty, this would cause a slow increase towards a feeling of hunger. However, this was not the case. My hunger pattern changes with peaks instead of slow changing curves. This warrants an explanation. You could assume that my body ”expects” foods at certain moments. The body expects a breakfast, lunch, and a dinner at certain times. For all my life I have been eating at these moments. It could be very much possible, that my body is adapted to these moments and therefore I become hungry exactly at these moments. However, this does not fully explain why these peaks around dinner time differ between 18 and 20 o ‘clock. If this theory was right, I should have had these peaks exactly at the same moment during the day but I didn’t. I always got these dinner peaks exactly when I was about to have dinner. So something else is going on. We could think that hunger is evoked by the mind. If I don’t think about food or see any food, I am not hungry. However, the moment I do think about food, I get very hungry, especially when I see that it is “dinner time”. I have to buy food, and I need to cook it. I can confirm that I get quite hungry from being in the supermarket, and even more when I am cooking. Therefore, I think that this is the correct explanation that my hunger is influenced heavily by the mind. This shows that it is not just your body who screams for food. People have been fasting for ages. We can survive quite long without eating anything. Everybody has (some) fat stored on their body that can be used for energy. There was a case of a man who survived fasting for 382 days; his weight went from 206 kg to 85 kg. Nonetheless, fasting this long can be dangerous even when you are obese, therefore it should be performed under correct supervision. Of course, the food industry knows already that our mind is controlling our hunger feelings. Commercials with delicious hamburgers make you drool at your tv-screens. The scent from a fresh baked apple-pie makes you just walk into the bakery, don’t you? Does this text even make you hungry? Thinking of food makes you hungry. We have to be aware of that. If we acknowledge the role of our mind on our hunger we might be able to influence our mind if we don’t want to over-eat. If you don’t want to over-eat, you might influence your mind by discussing against your mind and saying “No mind, I am not hungry, I have enough fat reserves!”. This might be quite hard to do but then remember that guy who fasted for 382 days. An easier solution could be to reduce the stimuli around you that make you think of food. I am often not very hungry through the day but when I have my breakfast, lunch or dinner, I become quite hungry. Therefore, my calorie-intake is almost in sync with my feeling of hunger. Considering the large peaks that occur in my hunger are exactly at the same hour as I eat my dinner, and the fact that the time of dinner varies between the week, seems like I get hungry whenever I am busy with food. My body is in control of my hunger but also is my mind. However, I am not sure yet who is the boss. This might require some future work.